Machining operations can be divided into two groups: roughing and finishing. The main difference between them is that the roughing operations perform clearance of the stock material and the finishing ones only perform surface machining. Rest milling operations differ from the others only by the default parameter values that are set during their creation. The list of all machining operations with a short description is shown below. The types of machining operations listed here are divided into the same groups that they appear, in the new operation creation window. The group is intended for systematization of different operations with similar parameters. 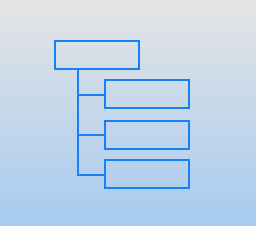 It is possible to form a job list with tree structure by operations groups. If some group parameters are changed then similar parameters of all included operations will be changed too. <Auxiliary operations> of SprutCAM designed to store the specific sequence of CLData commands (for specific types of machines, for particular company) into the named list, which can be saved and used many times in a process of work with the system. This, for example, may be such types of operations as clamping a chuck, tool interchange, approaching tail stock, part overturn, set of the active workpiece coordinate system G54-G59 and so on. Creates a set of machining commands for holes. These include drilling, boring, centering, tapping or thread milling. The operation can be used both for hole machining and for preliminary drilling in tool plunge points in pocketing and waterline roughing operations. Hole machining operation can be used to machine holes that are positioned differently, i.e. holes whose axes are not normal to the same plane. Note that operation can machine holes that are not lying in orthogonal planes. Waterline removal of material inside the defined area or pocket. 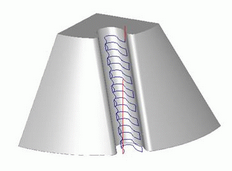 The shape of the area for pocketing is formed from curves created on the horizontal (XY) plane. This operation is used for the 2 & 2.5D machining of pockets and isolated areas, and also for preliminary material removal before engraving (2D finishing) operations. 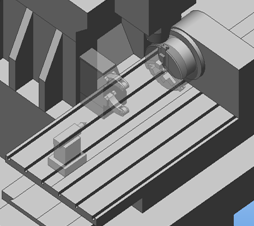 Waterline removal of stock material of a workpiece, which lies outside the 3D model. As in pocketing, the main part of the material is removed by the horizontal (XY) movements of the tool. The operation is often used for primary rough machining of complex models, which have considerable geometrical difference to the workpiece. Plane removal of stock material of a workpiece, which lies outside the 3D model. The sections lie in vertical parallel planes. To limit the pressure on the tool, machining can be performed with small preset Z depths. The finished operation is usually closer to the finished model than using the waterline operation with similar parameters. The operation is normally used when it is necessary to obtain a roughed workpiece that does not differ much from the source model. It is also useful when milling soft materials. As in the plane operation, removal of the stock workpiece material that lies outside the volumetric model is performed by separate cuts. 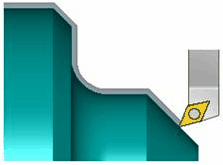 Depending on the operations parameters, cuts lie either in the vertical plane or in vertical mathematical cylinders, the shape and location of which are defined by the drive curves. To limit the pressure on the tool, machining can be performed preset smaller into Z depths. In some cases, the model after rough machining is very close to the finished model, but because of the uneven nature of the material being removed it is not always possible to reach an optimal machining time. The operation is best used only with certain workpiece and machined model shapes. The operation is used to carve the parts from the sheet. The outer contours and the contour of the holes can be defined by any closed or unclosed curve. 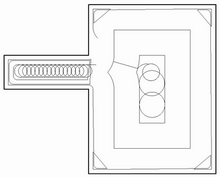 The carving is performed by the tool motion along the part contours. The holes are cut in first and the outer contour is cut later. For the machining of horizontal contours or curves projected onto the horizontal plane. 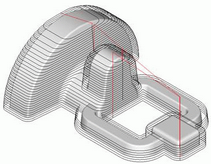 The horizontal movements of the tool are created based on the geometry being machined. The tool center or the tool edge can follow the contour. The operation is used for creating parts with vertical sides or for a machining pass with a constant Z depth etc. Generates a series of tool movements along freeform curves. The view of the toolpath in plane is similar to 2D contouring – tool movements are constructed with the tool center or edge passing along the contour. The Z coordinate at every point of the toolpath is calculated as a displacement based on the Z coordinate of the corresponding point on the curve. The operation can be used for machining of edges of parts of a die or for creation of a complex shaped groove etc. 1. The passes along the curves that is lie on the part surface. 2. The passes along the isoparametric curves of the defined surfaces..
3. The passes along the edges of the part. 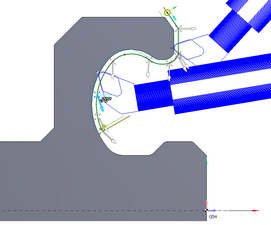 Morph operation generates a toolpath that smoothly morphs between two specified curves with high speed links. Available strategies include: Across, Along, Spiral. 3 to 5 axis toolpath with the following tool axis orientation modes: Fixed, Normal to drive curves 4d/rotary axis/drive curves 5d/surfaces 5d. Benefits: Many operations for the machining of: turbine wheels, turbine blades, and screws, as well as complex channels etc. High speed links. The Sawing operation is specifically designed for the fast programming of a saw blade for up to 5 axes milling of wood, marble, granite, stone and similar materials. Benefits: Automatically calculates the correct saw inclination, approaches and sawing motion. 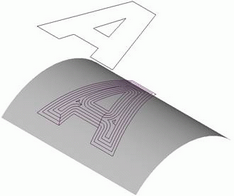 The operation is designed for the engraving of 2D geometry and inscriptions on flat areas. The image being engraved is formed from projections of curves onto the horizontal (XY) plane. Horizontal movements of the tool machine the main parts of the model's side edges. To create the sharp inner corners and for machining of smaller width areas, 3D milling is used. The operation is used for engraving of flat drawings and inscriptions and for finishing passes along side walls of pockets and for isolated areas during 2 & 2.5D machining. 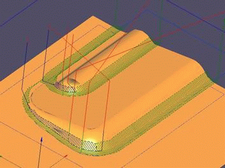 Waterline machining of surfaces of a volume model. Milling is performed by using horizontal movements of the tool. The operation gives a good result when machining models or their parts with their major surface areas that are close to the vertical. For machining of models of high complexity, it is recommended to use the waterline operation together with plane or drive. 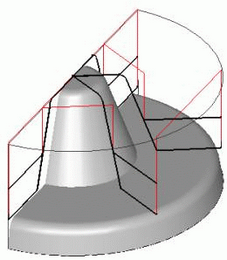 Plane machining of surfaces of a volume model. Passes lie in vertical-parallel planes. A good result can be achieved when machining flat areas and also areas close to the vertical that are perpendicular to the toolpath. Therefore, for machining of complex shaped models this operation is best used with the waterline or other plane operation, which has toolpaths perpendicular to the toolpath of the first operation. 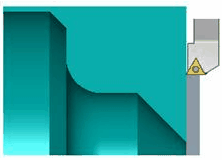 As in the plane operation, surface machining of a volume model is performed by separate strokes. Depending on operation parameters, the strokes lie either in vertical planes or vertical mathematical cylinders, the shape and location of which are defined by drive curves. The operation gives best results when machining separate areas of a detail with complex rounded wavy surfaces. It is best used for rest milling of surface areas of specific shapes, for machining of some models with smooth changing of surface geometry. And also, for milling inscriptions and drawings on a freeform model surface. 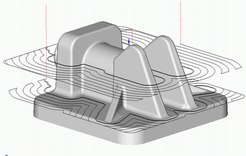 The toolpath for the surface machining of a volume model are formed in two stages. Firstly, the horizontal toolpaths (waterline), and then, for the remaining areas the toolpaths are created by using the rules for the drive operation. Because of this, both flat and steep areas are machined equally well. An even scallop height can be obtained when using a fixed stepover. Combined machining provides easier conditions for the tool, this allows using longer tools with a small diameter. The operation performs quality finish machining regardless of the model surface complexity, and also minimizes the machining time. 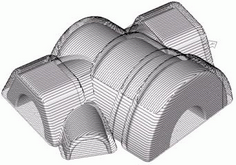 Two plane operations with mutually perpendicular toolpaths are created at a time for surface machining of a 3D detail. The default parameters of this operation are set so that every operation would machine only those surface areas of the model, where it can achieves an optimal result. This means that there will be a regular quality of machining on the entire model surface. Use of the optimized plane operation allows quality machining of models with difficult surface shapes, and also minimizes the machining time. 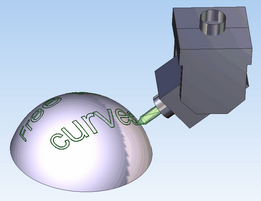 Two operations are created: plane and waterline for surface machining of a 3D model. Parameters for the operations are set automatically so that the flat areas are machined using the plane operation and the areas close to vertical by the waterline. As a result, there would be a proportional quality of the entire surface of the machined detail. The complex machining provides easier conditions for the tool, this allows the use of longer tools with a smaller diameter. The operation allows performing quality machining for any surface angle, and also minimizes the machining time. The operation allows to make a finish machining of flat horizontal surfaces of a part. 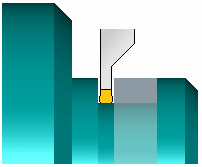 The flat segments are recognized automatically. 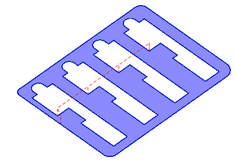 A tool toolpath consists of series of horizontal patches. All not horizontal segments of model for machining are inspected to avoid gouges during machining. The rotary machining operation is used for the machining of the camshafts, crankshafts, worm shafts, paddles, decorate parts and so on.This operation is available if machine has at least one continuous rotary axis. The area rest milling operation performs rest milling of remaining material. That is, it performs a waterline rest milling inside the defined area or pocket. The shape of the area is formed from curve projections on the horizontal (XY) plane. The operation is used for the remachining of residual material using a tool of smaller diameter than the previous tool for 2 & 2.5D machining of pockets and isolated areas. 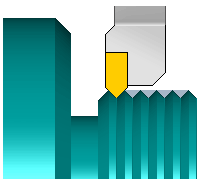 Rest milling of a models surface using a waterline finishing operation. Model surface areas, insufficiently machined by the previous operations are milled using horizontal passes of the tool. A good result can be achieved when machining almost vertical areas. Rest milling of model surface using plane finishing operations. Model surface areas, insufficiently machined by the previous operations are milled using passes lying in vertical parallel planes. The operation is intended for use when remachining slightly sloping areas and areas close to the vertical that are perpendicular (or close to) the toolpath. Rest milling of a surface model by drive finishing operations. A model's surface areas, insufficiently machined by the previous operations are milled using passes lying either in vertical planes or mathematical cylinders. 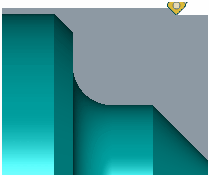 By default, the drive curve should be formed along the unfinished areas, which allow rest milling to be performed with minimum number of passes. The operation gives the best results when machining non-vertical areas. 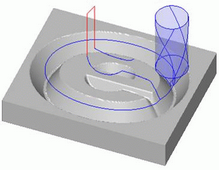 Rest milling of a surface model by optimized plane-finishing operation. 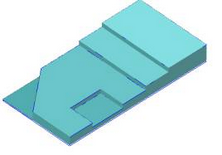 Models surface areas, insufficiently machined by a previous operation are milled by using 2 plane operations with mutually perpendicular toolpaths. Because each operation only machines its optimal area, good results are achieved. Rest milling using plane-optimized operation is recommended for use where there are relatively large unfinished areas. Rest milling of a surface model using the complex finishing operation. A model's surface areas, insufficiently machined by previous operations are milled by two operations: plane and waterline. Flat areas are machined by the plane operation and areas close to vertical by the waterline. 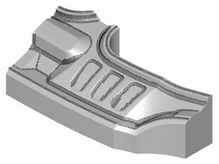 The operation allows quality rest milling of free-form areas at any angle of the model surface. The operation makes spatial transformations of a toolpath of any operations with copying or multiplying by a scheme. It is expedient to apply to machine models with repeating fragments. The operation allows to reduce time of calculation and debugging of an NC-program. Universal Lathe contouring operation allows you to create a complete set of strategies for turning: OD, ID, face rough and finish turning, threading, grooving, etc. The operation uses a simple and reliable algorithm for the toolpath calculation, which takes into account only the necessary parameters. 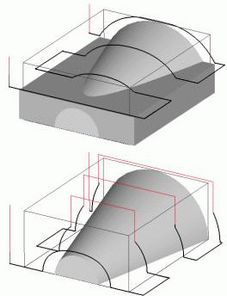 For example, for the cutter insert geometry are taken into account only the nose radius and the limiting angles. 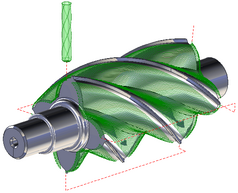 This allows to emulate algorithms for turning cycles used by manufacturers of CNC controls. 4-axis turning cycle allows to machine hard-to-reach areas of a part with just one operation by continuously changing of the tool inclination angle in the process of moving along a contour (using the 4-th axis of the machine, if available). This reduces the number of tool changes, thus increasing productivity. In addition to the defined contour geometry to calculate the toolpath information about the tool inclination angles in some points of the contour also is used. 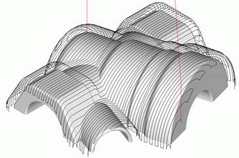 The user can specify any number of angles of the tool, which can be set at an arbitrary point of the contour. The operation is designed for the removing of the sizeable part of the workpiece. It can be used when the workpiece is much different of the part. The material is removed by the series of the parallel tool motions. The operation provides to remove a lot of workpiece volume in the shortest time. The operation is designed to machine the uneven ends. It is used to prepare the base surface before the drilling or before another turning cycle. The operation can be uses either for finishing or the roughing machining. The operation is designed to generate the NC commands to machine the axial holes. 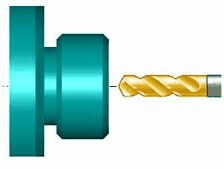 The next cycles are supported: simple drilling, deep drilling with chip breaking or removing, threading by tap. There is the possibility to set the cycle output mode: Long hand, single block cycle or canned cycle. The operation cut out the part with the additional chamfer or rounding machining. The size of a groove, the chip breaking parameters and the delay values can be set. The operation is designed for the final finishing machining. 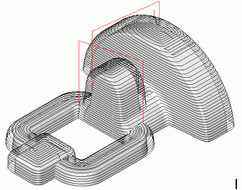 The machining is performed by the offset motions along the part generatrix. It gives the best result if the part and workpiece have the little differences. 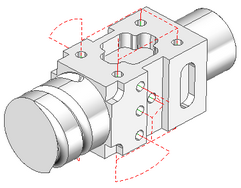 The operation allows to generate the toolpath without the workpiece checking. The operation is designed for the groove machining and other zones that can not be machined by other lathe operations. 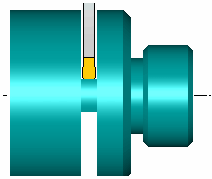 The cycle generates the tool path according to the groove tool possibility to cut by the front side. The tool path can combine the rough path for the workpiece volume removing and finish path for the shaping. The workpiece volume can be removed by some layers with the different strategies and cutting directions. There is the possibility to switch on the chip breaking and delays. 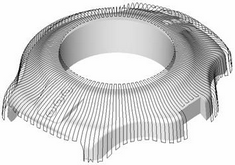 The <Wire EDM 2d Contouring> operation is designed for wire path generation along flat contour on 2d contouring as well as along flat contour with wire slope angle on taper or 3d contouring. 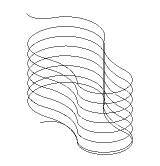 Resulting wire path is based on contours, which lays in one plane. 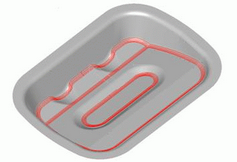 The <Wire EDM 4d Contouring> operation is designed for wire path generation along two flat contours simultaneously. One of this contours is set moves of lower guide of wire EDM machine, to put it more precisely – moves in working (XY) contour plane. 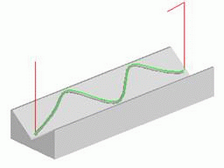 Second contour is set moves of upper guide of wire EDM machine – leading (UV) contour. Thus, in the operation upper and lower wire ends can to moves on different paths.